This loaf is free from added sugar and oil. 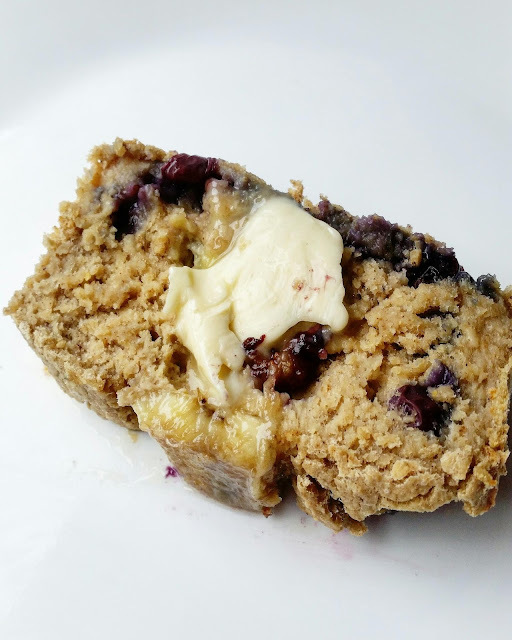 It's butter-free and is sweetened with fruit. It's vegan and gluten-free. Serve for breakfast or for a sweet treat and enjoy a delicious, nutritious bite. 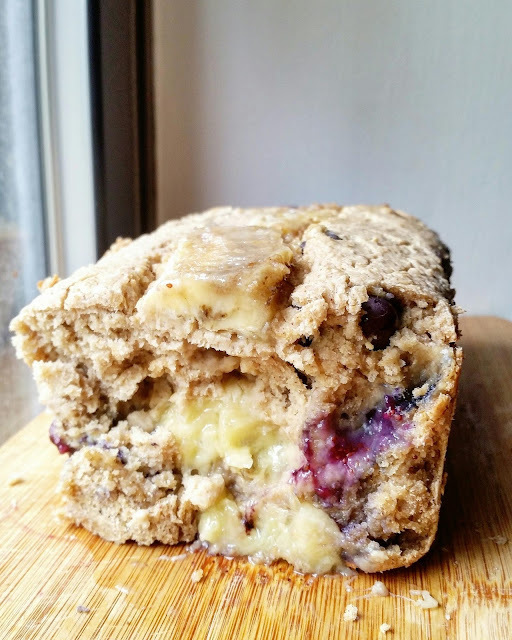 I love a sweet loaf of bread made with local, in season fruit. I bought raspberries and blueberries at the farmers market and I bought a bunch of bananas at the fruit cart. I also love using banana as a sweetener-ripe bananas are so versatile that way; you can make ice cream and sweeten baked good with your spotted bananas so don't EVER throw out spotty bananas! I whipped up this loaf in no time using my food processor and oven and I've already tasted it-it gets a gold star. I love how there is no sugar or oil in this loaf as I tried to keep it lower in calories. It's also made with oat flour, which is nutritious and naturally gluten-free. I know you will love this recipe! Combine the soy milk and vinegar and set aside. Put the dry ingredients into your food processor and process well. I used quick cook oats and processed them into flour. Put the mashed banana and wet ingredients into the food processor and process well again. Hand mix in the blueberries. Spray a loaf pan with oil and pour the batter into the loaf pan. 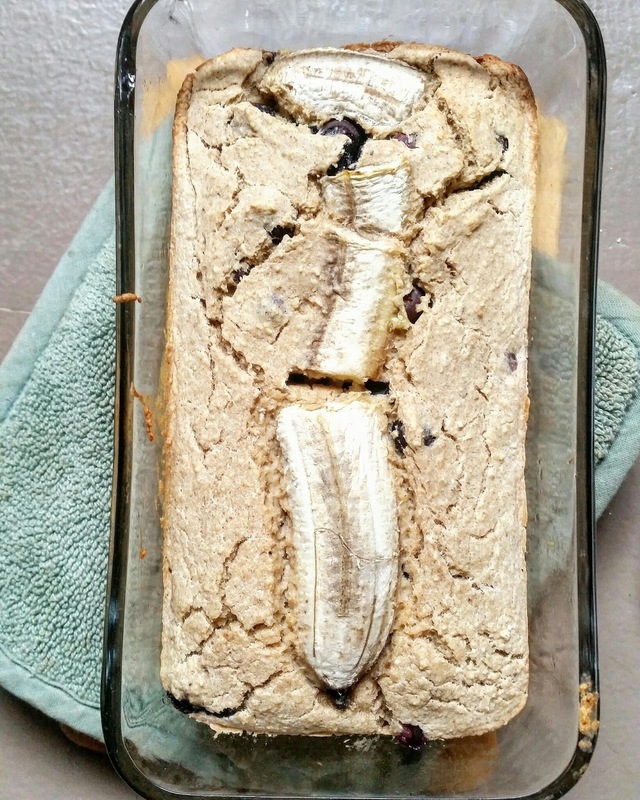 Cut a banana in half and push half of the banana into the batter and put the other half on top of the batter. Bake at 350 degrees for 40 minutes. Let cool, slice and serve. You don't need the maple syrup; the ripe bananas make the batter sweet enough so add the syrup only if you wish. You can use any flour you wish but I love oat flour because I make it from quick cook oats. Add any spices you wish. You can swap out 1/2 cup of pumpkin for the 1 mashed banana. Use any non dairy milk you wish. Add different berries such as raspberries or blackberries. Add some non dairy butter on top; this is great with your morning coffee.